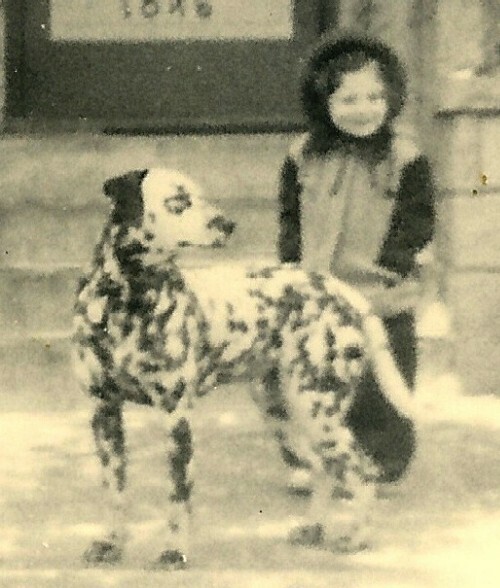 Duke Hertz was a Dalmatian who lived with the Hertz family when Nanci was a child in the 1940s. This photo of Duke with Nanci was taken in 1946. The Dalmatian is a breed of dog whose roots are often said to trace back to Dalmatia, a region of Croatia where the first illustrations of the dog have been found. The Dalmatian is noted for its unique black- or brown-spotted coat and was mainly used as a carriage dog in its early days. Today, this dog remains a well loved family pet and many dog enthusiasts enter their pets into the competitions of many kennel clubs.